Building on the P5's legacy nicely, it adds modern features but retains the all-important killer sound. Expensive. Audio input would have been nice. Despite DSI making some fantastic synths over the last few years, there has been a conspicuous hole in its line-up left by the original Prophet-5. While the Prophet 08 was its nearest true successor, its DCO-based architecture meant that, although it could nicely emulate the vintage sound (and sound much more modern too), it was an altogether different beast. We dare say if you'd surveyed synth heads a few years back asking what synth they'd most like DSI to make, it would be a unanimous shout of 'a new Prophet-5 with VCOs'. Well, fast forward to 2015 (some 37 years after the Prophet-5 launched) and we now have the Prophet-5's spiritual successor - the Prophet-6. To say we were a little excited about trying the P6 is something of an understatement; in fact it had us drooling in anticipation! 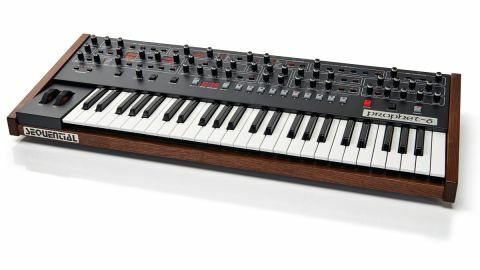 The P6 arrived in a rather boring brown cardboard box but, once out of its temporary home, the P6 revealed itself to be a thing of beauty with its walnut end pieces and trim - it certainly looks like a legit Prophet-5 successor. One important thing to note is the Sequential badge. Most of you will know that before Dave Smith Instruments, there was Sequential Circuits which produced classic analogues such as the Prophet-5, T8 and Pro 1 (among others). In 1987, Sequential was sold to Yamaha and no more Sequential branded products were made and, up until a few months back, Yamaha still owned the Sequential name. However, this changed when Dave's friend Ikutaro Kakehashi (founder of Roland) suggested to Yamaha president Takuya Nakata that Yamaha give back the Sequential name to Dave - Mr Nakata agreed! Hence, we now have a Sequential badged Prophet-6. The P6 is a sturdy instrument weighing in at 20lbs, although it's surprisingly compact due to its shorter four-octave keyboard. The chassis is metal and also hinges at the back for easy access to the innards. Power comes in via a kettle lead, as you'd expect on a premium instrument. One great thing is that the voice cards in the P6 are all in separate sockets and can be removed easily down the line for replacement/service if necessary - a clever move by DSI which should help ensure the future longevity of the instrument. The top panel is laid out clearly in a P5-style with the graphics silkscreened directly onto the panel and the switches are a mixture of later-style DSI push buttons and P5-type selectors with LEDs. These all feel sturdy and should stand up to long-term abuse on and off stage. "To our ears the most authentically vintage-sounding DSI polysynth to date and it sounds nicely different to the P08, Pro 2 and P12 - it has a very wide sweet spot and it's pretty hard to get it to sound bad!" The plastic/rubber-coated/silver knobs will be familiar to owners of the Prophet 08, Pro 2 and P12, and feel good with a nice amount of resistance, though there is some play in them. Back to the keyboard for a moment. The four-octave design keeps the footprint small which is useful for smaller spaces and makes the P6 easy to transport. Undoubtedly, some players will prefer a five-octave keyboard (and personally speaking we would have liked an extra octave, as we think five is perfect for a performance synth) but most of the time, four octaves is sufficient and chances are the P6 will be part of a multi-board rig on stage at least, thus you'll not always require two hands on deck simultaneously. When you do require that extra range you can use the very fast octave switches or connect an external MIDI board. For soloing and most two-handed duties, four octaves is fine and we've never had an issue soloing on our Moog Voyager which is only three and a half octaves. Food for thought! Feel-wise, the semi-weighted synth-action keyboard is massively playable and buttery - it's perfectly balanced for playing fast and accurately. The velocity and aftertouch response is also near perfect allowing smooth and predictable modulation builds but response can be further tweaked in the global settings if needed. There are performance controls in the shape of standard mod and pitch wheels but alas no P12/Tempest style touch-sliders, though we can see DSI has chosen to keep this synth firmly in the P5's mould so there's nothing that strays too much from the original. One of the biggest draws of the P6 is the aforementioned knob-per- function, zero menu-diving ethos. This is very much a 'use your ears not your eyes' board and we really welcome the lack of visual distractions which keeps you focused on the sound. However, the basic three-digit LED display means there's no patch naming and you have to remember your sound by number (much like a Nord Lead 4), though an editor is available from SoundTower for a modest outlay which will help you organise, name and dissect patches. Finally, 'live panel' mode is accessed by turning off the 'preset' button. We hope the bank and 'tens' buttons become operational as patch up/down buttons (they are already labelled as 'increment/ decrement') which will speed up patch selection greatly. At the top left is the P5's famous 'polymod' section which has now been augmented to address the additional high-pass filter (the P5 had just a low-pass) plus there's an additional dial labelled 'shape' which modulates the waveshape of Oscillator 1 for adding movement to sounds. Below this is the new digital effects section and to the right, the great-sounding analogue distortion that has become a feature of recent DSI synths. Under the effects section is a single audio-rate capable MIDI-syncable LFO - yes there's just one LFO but with the polymod section and the fact that Osc 2 can act as a secondary LFO, there's enough in the way of modulation to keep things interesting. The LFO has five main shapes (plus a noise source selected by choosing 'random' and turning 'frequency' fully clockwise) and these can be sent to up to five destinations including the frequency and pulse width of both oscillators and to the amp, LPF and/or HPF. The 'initial amount' dial controls the amount of LFO modulation sent to these destinations and when set to 0, the LFO modulation is controlled by the modwheel, with the amount of modulation dictated by the mod wheel's position. Now the sound! Dave has gone back to discrete VCOs, VCFs and VCAs for the P6 and they really sound excellent with that vintage vibe! The two newly designed oscillators are pretty much dead on pitch from the word go and stay solidly in tune (as you'd expect). If they do drift out due to sudden external temperature changes (unlikely), simply hold the preset button and 0 to run the calibration procedure. Unlike the P5, each oscillator now has a continuously variable waveshape from triangle through to square/variable pulse (much like current Moogs) enabling a wider range of tones than the P5's hardwired (though simultaneously available) waveforms. "To say we were a little excited about trying the P6 is something of an understatement; in fact it had us drooling in anticipation!" With such stable VCOs onboard Dave has included his famous 'slop' parameter which induces natural sounding oscillator drift - just a small amount can really liven up proceedings and add extra movement and vintage-style detuning to the P6's otherwise stable sound. We think this is a good compromise and we'd rather have super-stable (albeit still vibey) VCOs and be able to dial in any desired level of drift with 'slop', than have completely unstable VCOs that are a headache (like our Memorymoog for instance!). There's also a digital white noise source too. Sonically, the P6 is to our ears the most authentically vintage-sounding DSI polysynth to date and it sounds nicely different to the P08, Pro 2 and P12 - it has a very wide sweet spot and it's pretty hard to get it to sound bad! It's definitely the legitimate heir to the P5 in many respects and it excels at present leads, punchy/deep basses, nicely defined yet warm evolving pads/ atmospheres, sync leads, synth brass/ comping patches and huge unison solo sounds. There's also chord memory, a great sounding four-mode portamento/ glide function and a versatile mono-unison mode where you can stack up to six voices. The LPF (taken from the Pro 2) and HPF sound superb and the envelopes are super-snappy - great for making punchy basses that can even give Moogs a run for their money (it's definitely easier to make great sounding basses on the P6 compared to the P08 and P12). Also, with the triangle sub-oscillator dialled in, you can really feel the extended lows. The P6's frequency range is huge, ranging from earth-shaking subs through to punchy high-mids, sizzling tops and piercing out of control warbles (especially when the filter resonance is pushed). Also, the high-pass resonant filter (though not self-oscillating) really opens up the sound sculpting possibilities and acts as a band-pass when combined with the LPF. We should also mention that unlike the P5 (which had no velocity or aftertouch) you can send velocity to both the filters and amp too which is a big improvement. When you then add in the 64-step polyphonic MIDI (and audio) syncable sequencer, the great-sounding digital effects, MIDI control over most parameters, USB-MIDI communication, alternative tunings and above all that killer sound, the P6 is surely destined to be a future-classic. Thankfully, there are very few downsides to report and, although an audio input and CV ins/outs would have been nice, the P6 certainly carries forward the torch of its vintage predecessor admirably. Obviously, as a premium self-contained discrete VCO/ VCF polysynth it's not cheap, sitting just below the flagship P12 price-wise (and feature-wise it's more streamlined than the P08, Pro 2 or P12); nonetheless, it's surprisingly versatile and sounds a million dollars - we think for most of us, that's the bottom line!